…Of everything I read Terry Laundry’s Magic T Theory made the most sense to me. …Terry was an eccentric genius living out on Nantucket Island. He was a fellow Marine, a jughead, who’d graduated from MIT and was now using his considerable engineering skills to analyze the market. Terry believed that the market spent the same amount of time going up as it did going down…When you look at the letter T, hence, the Magic T Theory…With the Magic T there was order in the universe a high and low tide every…The Magic T and I became as one. For today’s discussion we have two charts below; the first for the near term outlook using my regular daily charts, the second for the longer term Ts. See these charts or download them if you wish, then listen to my audio commentary, part A for the first chart, part B for the long term chart. Helpful Hint for Windows users; I have been told that if you are not getting the audio stream to work for you, right click on the audio link and it will download the audio file to your computer, after which you can play it. Daily Updates will continue at the Foundation site as noted above. 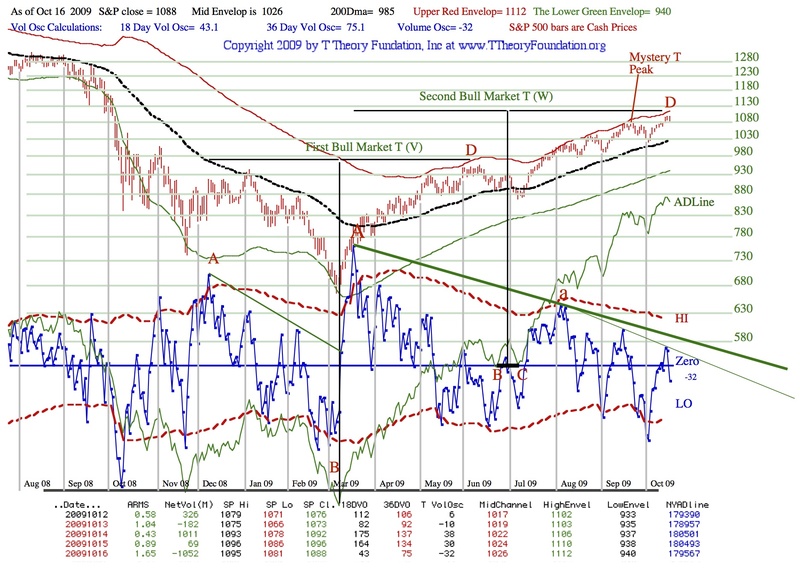 For today’s discussion see the two charts below; the first for Best Bond, the second for the standard T Theory indicator chart. The audio discussions for part A and B relate to the discussion I had with Peter Eliades last week. I hope these topics help to answer a variety of email questions I have received. Part C is my general forecast which will be refined by the end of day updates, as noted above, that will come by 6:30 pm ET at the Foundation site. Today we have just one chart with data added and a number of discussions that help resolve questions I have received. First Download the new Chart below. Then Listen to the three Audio Commentaries below. Todays strong gain meets nearly all the peak requirements for the ABCD T construction on a closing basis. The date is within range and the market is at token new highs above the Mystery T’s mid September peak. The closing S&P is just shy of the upper envelop target level of 1106 but that might be reached tomorrow. The very short term T on Sunday can have its center date more later by one day so it is possible we have seen the momentum peak today and the upside strength will rapidly dissipate. 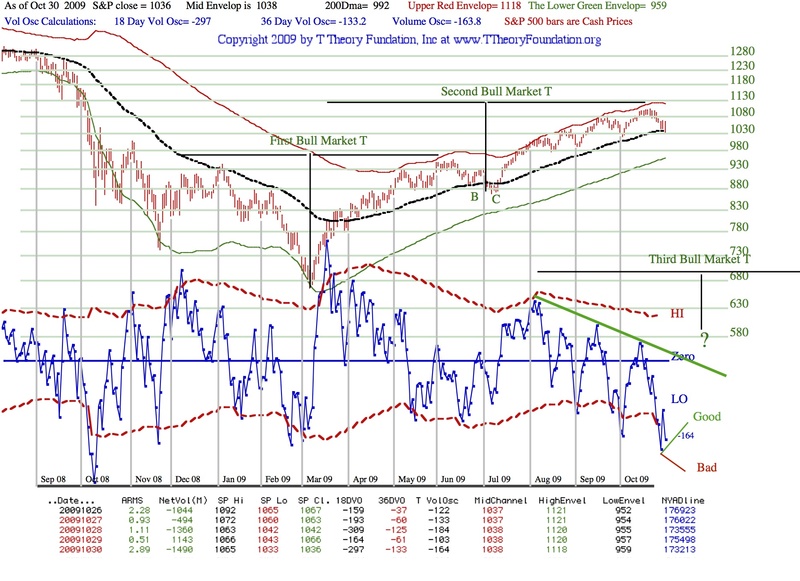 Lots to talk about today in the two charts below and the extended commentary which confirms top projection Oct 12 to Oct 14 as per last weeks notes. 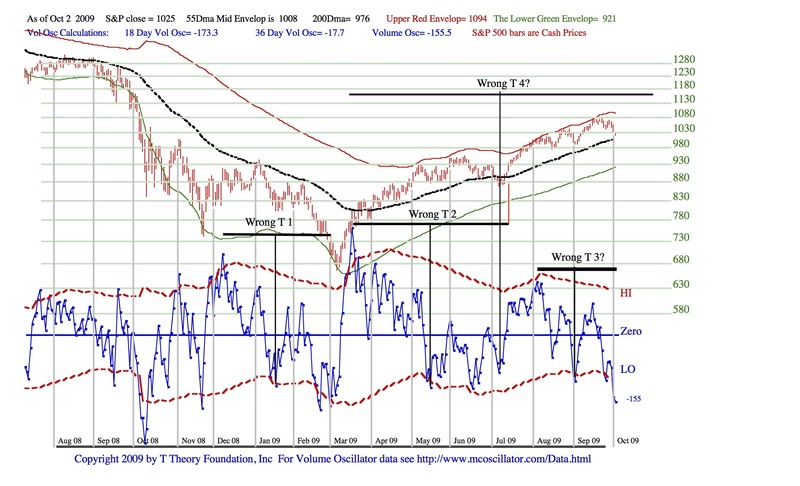 Then we move on to explaining T Theory in term of “echos” to better explain the longer term outlook into August 2010. From your PDF file, using 15 minute real time data, it looks like “A” occurred on 3/19/09 @ 9:30 AM (S&P 803.24) and “B” occurred on 6/23/09 at 11:00 AM (S&P 888.86). This represents a 68 day, 2 hr time lapse from “A” to “B”. The subsequent July low “C” (S&P 870.05) occurred on 7/8/09 @ 12:15. Therefore, the October high “D” looks like it may occur on 10/12/09 @ 14:15. 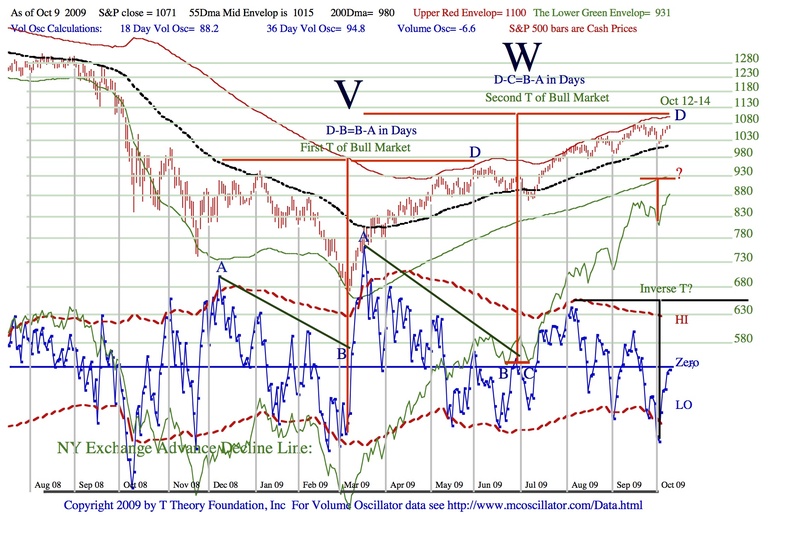 I am changing my outlook back to the original forecast of an important peak and selling point on Oct 12 13 14 as below. The performance on Thursday was negative in my view as we are losing momentum and the volume oscillator is probably topping at the zero line. The mid Oct peak(D) is being estimated as Oct 12, 13, or 14th. It is positive that the Arms selling climax and Wrong Ts bottom date has halted the slide to the 55 Day MA. Should be headed up from here. 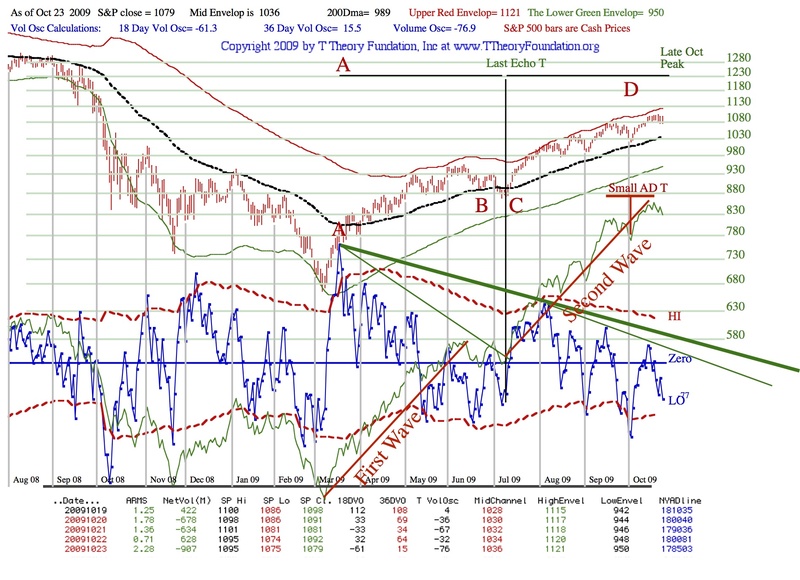 Expect Low early next week (Monday) intraday at S&P 500 cash 1008 then rally to mid October high sell point. See long discussion in three audio parts with two PDF Charts. This entry was posted on April 17, 2013 at 11:27 AM and is filed under . . . T Theory®. You can subscribe via RSS 2.0 feed to this post's comments. You can comment below, or link to this permanent URL from your own site.